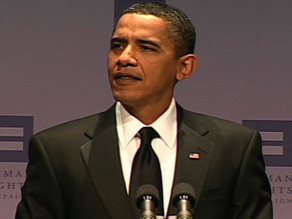 WASHINGTON (CNN) -- President Obama delivered a rousing speech Saturday night to the nation's largest gay rights group, praising the gay community for making strides in equal rights and pledging to deliver on major campaign promises that some say he's left on the back burner. President Obama speaks Saturday night at the Human Rights Campaign dinner in Washington. "For nearly 30 years, you've advocated for those without a voice," Obama said during his address at the dinner for the Human Rights Campaign. "Despite the progress we've made, there are still laws to change and hearts to open." Obama's speech came as gay rights activists continued to lose patience over the lack of change to key issues for the gay community -- including the Pentagon's "don't ask, don't tell" policy. It comes on the eve of a major gays-rights rally in Washington. "This fight continues now and I'm here with the simple message: I'm here with you in that fight," Obama told the applauding crowd. The Human Rights Campaign issued a statement praising the speech, saying it was a "historic night when we felt the full embrace and commitment of the president of the United States. It's simply unprecedented." Obama called for the repeal of the ban on gays in the military -- the "don't ask, don't tell" policy. "We should not be punishing patriotic Americans who have stepped forward to serve this country," he said. "I'm working with the Pentagon, its leadership and the members of the House and Senate on ending this policy, legislation that has been introduced in the House to make this happen, I will end 'don't ask, don't tell.' That's my commitment to you." The president said he backed the rights of gay couples, saying they should have the "same rights and responsibilities afforded to any married couple in this country." He said he has urged Congress to repeal the Defense of Marriage Act and to pass the Domestic Partners Benefit and Obligations Act. Obama also touched on protection against hate crimes, noting that legislation was passed in the House this week that expanded the definition of hate crimes to include attacks based on sexual orientation and gender identity. "I can announce that after more than a decade, this bill is set to pass and I will sign it into law," he said. Obama acknowledged the fact that many in the gay community don't believe government is moving fast enough to address their concerns. "Many of you don't believe progress is happening. I want to be honest about that because it's important to be honest among friends," he said. "I said this before, I'll repeat it again, it's not important for me to tell you to be patient." "While some may wish to define you solely by your sexual orientation or identity alone, you know and I know that none of us want to be defined by one part of what makes us whole," he said. "So I know you want me working on jobs and the economy and all of the other issues that we're dealing with." Still, Obama said, it's imperative that the gay community continue to pursue the policies they support. "It's so important that you continue to speak out and you continue to set an example and that you continue to press your leaders, including me, and to make the case all across America," he said. The Human Rights Campaign in its statement praised Obama's pledge that "we will see a time in which we as a nation finally recognize the relationships between two men or two women." The group said Obama "made it crystal clear that he is our strongest ally in this fight, that he understands and, in fact, encourages our activism and our voice even when we're impatient with the pace of change." Hillary in 2016, maybe?!! She says "NO"